Three times a day Caremar ferry boats leave from Sorrento for Capri (Caremar stands for Campania Regione Mare). The ride takes about 30 minutes. The white-blue boats are well equipped, there are several bars on board that serve snacks, coffee and tea. The boats are car ferries, and also call at the ports of Naples, Ischia and Procida. You can click here for timetables. Another company servicing the Capri Sorrento route is Snav. This is a shipping company serving not only the routes in the Gulf of Naples, but the Mediterranean region. Snav also has a travel magazine, click here to take a look. 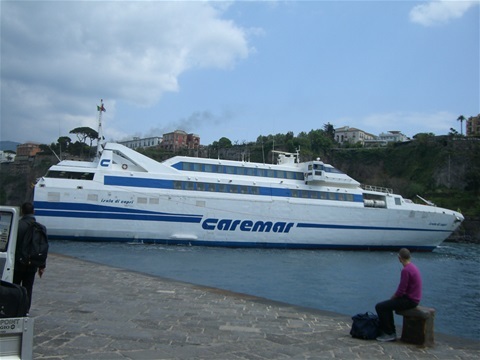 By the way, every day at 9:35 am you can watch the Caremar boat leave Sorrento by viewing this link to the Sorrento Harbor Webcam at this homepage.